In this post you’ll find a description of some plant diseases and insects that I saw in my garden. I added some photos. Info from internet and my own experience. In early summer (June) it can happen that “many onion plants in your garden are ill”. See photos and descriptions below. Leaves of the onion plants are yellow – brown and lie on the garden soil. In the onions there are maggots of the onion fly. Onion plants will die. Leaves of the onion plants are green and curled. In the onion you see “eating grooves” and maggots or brown pupae. The onions will grow to big ones with deviating shape as shown on the photo above. A3) Help against onion flies and/or leaf miner flies. Plant only few onion sets in early spring (March and April). In these months, there is big risk of attack by leaf miner flies and/or onion flies. Leaf miner flies lay their eggs on leeks and onions in March and April (early spring), as mentioned in this internet article . But……you can plant “many” onion sets in March and April (early spring) when you put a layer of hay on the soil between and around the small onion plants. Due to the layer of hay, the soil does not dry out so fast. And there is less attack by the onion flies and miner flies. See chapter A5). Plant most onion sets in mid spring (May). The leaf miner flies are not active during that time. Putting hay around and between the small onion plants works well too; soil does not dry out fast. Harvest the onions in July to September (late summer, early fall). Onions are big enough then. Leaves get yellow and topple and the onions do not grow thicker anymore. The first row contains onion plants from onion sets that were planted in early spring (April). Many onion plants have been attacked by onion flies or leaf miner flies. Two rows of onion plants from sets planted at mid spring (May 15). All onion plants look healty. At the end of August (late summer) they have grown into normal sized onions. Conclusion: onion sets planted in May (mid spring) give a good harvest in August (late summer). And there is little attack by insects. When you have planted onion sets in early spring (March, April), you better lay some dry hay or mowed short grass between and around the little onion plants. The soil will not dry out so fast, the onion plants grow well and show less diseases and damage of onion flies or leaf miner flies. At later planted onion sets, you can also put dry hay between and around the onion plants. That works well too. In short, hay around all onion plants is okay. A6) Test: planting date and hay around. At March 20, one onion set has been planted in the garden soil, in a small furrow. Each subsequent day, another onion set was planted in that furrow and thus forming a row. Distance between onions was about 10 cm (4 inch). At May 1, the 43th onion set was planted in the garden soil in that row. The row was full then. With this experiment, one can determine which onion plants are attacked by flies. So what planting dates are good or bad. From the beginning of April on, a thin layer of dry hay has been put around and between the onion plants that were visible. This is done because I have found that dry lawn grass (short hay) on the soil around sown onions shows less attack of flies. Maybe hay (= dried grass) on the soil also helps at onion sets. Hay is for sale in a pet shop and not expensive. One year later, the experiment was repeated with 3 rows of onion sets. From March 20 until May 1, each subsequent day 3 sets have been planted. Later on, dry hay has been put between and around small onion plants of 2 rows. In the other row, fresh mowed grass or dry straw has been put around and between the onion plants. No (little) attack by the leaf miner fly or onion fly observed. A few plants showed curled leaves. Harvest: many big onions and a few small onions. Most onion sets grew into big onions (38 out of 43 and 115 out of 129). There is little weed between the onion plants. And weed plants are easy to remove (pull out). Putting hay around the onion plants works well against attack by onion fly and leaf miner fly. Even during the “risk period” of the leaf miner fly (March and April). In each row with hay around the plants, more and bigger onions grew. So dry hay works better than grass or straw. Earlier planted onion sets brought bigger (heavier) onions than later planted ones. The last 6 planted onions in each row showed no attack by flies. More and detailed info at chapter E)# of tip 5) Planting onions in a small furrow. In early summer (June) some leek plants can have curled leaves. Similar to the curled leaves of the onions caused by the leaf miner fly. There are no maggots or pupae. Only white eating grooves in the green leaves. As indicated between the 2 red arrows. This attack is caused by leaf miner flies. Do not plant out the leeks that have been attacked. Sow more leek seeds so you have more leeks to plant out later. Try out if liquid nettle manure spraying helps. More space between the leek plants. So a bigger distance between leek seeds or extra thinning out small leek plants. Grow small leeks in your garden under a tunnel greenhouse with ultra fine mesh netting at both ends of the tunnel. In autum, leaves of leek plants can look like this. This disease is called purple blotch. The leaves have purple spots. The leaves have “dead ends”. After removing the coloured leaves, the plants are okay. This disease occures after a cold and wet weather period. Maybe after planting leeks too deep or too much manure added. The disease occured in my garden (for the very first time in more than 25 years) in 2012. Internet: Shallow planting. Adding less manure. Putting garden earth around the plants not until the plants are big. My experience: Put leek plants in round holes (diameter 6 cm, 2.4 inch) in the garden soil. Keep the holes “open” for a long time. This results in no risk or little risk of this disease. Brown pupae in leeks frequently occurs. Almost every veggie gardener has seen the brown “things” on and under the leafs of a leek. There are cracks and tears in the outer white leaves of a leek. The edges of the cracks are light brown. In this chapter you find an extensive description about this attack (and how to reduce this attack). In late autumn or early winter there can be brown pupae when harvesting leek. See photos below. Some (white) parts of the leek plant have long “cracks” or “tears” with light brown edges. Eating tracks are visible on leaves and white parts. Pupae hide in leaves or at other parts of the plant. Pupae are about 4 mm long (1/6 inch) and dark or light brown. On the lowest photo at the right you see a maggot (or small pupae) that is somewhat smaller. Sometimes there are some maggots on the leek. This maggot is still eating leek material. It is not yet ready to transform into a brown coloured pupa. The lowest photo with a wooden cocktail pick shows the size of the maggot. These pupae and maggots are children of the “allium leaf miner flies” also called “leaf miner flies”. You can find info about this disease on the internet, for example on this site . Leaf miner flies lay their eggs on the leaves of the leek plants in spring (early March to early May). Eggs –> white maggots –> brown puppae. The pupae “rest” until the end of summer. During this rest period, the pupae are in the leek plants (or somewhere else, such as in the garden soil or in leaves of leek or in compost). In the end of summer, and the beginning of autumn (end of August to end of October), the miner flies hatch from the pupae. These new miner flies lay their eggs on the leaves of (new) leek plants. The pupea from these flies overwinter in the leek plants (or in the soil, leaves or compost). In spring new miner flies hatch from these pupae. Shove some garden soil against the long sides of the tunnel. So the edges of the tunnel are below soil level. Keep the tunnel closed when possible. Only open the tunnel when watering. Water the plants early in the morning or late at night. Close each end of the tunnel using ultra fine mesh netting. You can saw a square hole in a perspex plate and tighten the netting over this hole. You can fasten 4 wooden laths around the square hole in the plate, while the mesh netting is clamped under these laths. (I did not yet try this method but I’m gonna do that in spring 2019). Mostly there are leeks (autumn leek or winter leek) growing in the garden soil in summer and fall . To prevent the leaf miner fly from laying eggs on the leeks, you can do as follows (new procedure 2018). Trim the leaves of leek plants near the end of summer (September 1). From then on, trim the leaves of the leek plants weekly to keep the same leaf length as after the first trimming. See photos and description below. Big and small leek plants in the garden soil at the end of summer (September 1). Trim all leaves of all (big) leek plants at the end of summer (September 1). Photo above; all leek plants of 3 left side rows have been trimmed. All other leek plants in this area have not been trimmed. After trimming the leaves of a leek plant, it has a “Y”shape. The trimmed leaves form a narrow hand fan. Leaf miner flies lay their eggs on the outer leaves of a leek plant. That’s visible at attacked leeks; many pupae in (on) the outer leaves, few pupae on the next leaves of a leek. The outer leaves of a leek plant are long, curved and have a horizontal part. Miner leaf flies prefer to lay their eggs on the horizontal part of a leek leaf. From that spot on, the maggots burrow in the leaves towards the base of the leek plant. On trimmed steep leaves, the miner flies do not lay eggs on. You can imagine that the fly has less “foot grip” on steep leek leaves. A leaf miner fly starts looking for a non trimmed leek plant with long leaves. Once found, the miner fly lays its eggs on the horizontal parts of the long leek leaves. Results: At trimmed leek plants there is little or no attack by the leaf miner fly (no or only a few maggots and/or pupae) . 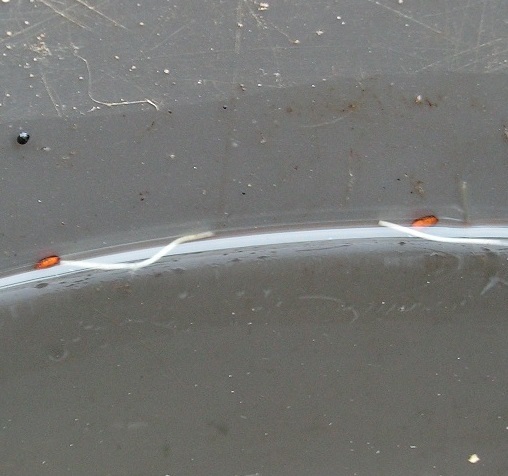 Leek plants with long leaves suffer from serious attack by the leaf miner fly (many maggots and/or pupae). At most leek plants with trimmed leaves, there is no dry hay on. As an experiment you can lay dry hay on top of some trimmed leek plants. Long leaf hay works better than short leaf hay (stays much better on the leek plants). During or after laying on the hay, some hay can fall on the garden soil. No problem as long as there is still some hay on the plants. Hay on the soil also keeps the garden soil moist. That is okay. After trimming, the leek plants will grow bigger again. The leek leaves grow longer and higher. Some hay can drop off the plants. From now on trim the leek leaves weekly until the length of the first trimming. And lay new hay or dropped off hay on the “hay leek plants” again. Repeat this weekly trimming and laying hay on until mid autumn (beginning of November). Fom mid fall (early November) on, the leaf miner fly does not lay eggs anymore. So trimming (and laying hay on) is not necessary. Leek plants in the garden soil at the end of October (mid autumn), after trimming and/or laying hay on. On the left side photo there are leeks without hay. Most leek plants have been trimmed weekly and show short leaves. Leek plants at the far left side of the photo have been trimmed once, at the beginning of September (late summer). These leeks have long leaves now. At the right side photo you see weekly trimmed leeks, with or without hay on. The same leek plants at November 1 (mid autumn). At this time you can remove the hay from the leeks. At cold moist weather, leek plants can start rotting due to the wet hay laying on the plants. From November (mid fall) on, leek has been harvested. On the photo above you see harvested leeks. There are 3 groups of leek. Under each group of leeks there is an indication; Nothing, Trimmed or Trimmed and hay on. Below an explanation of the groups. Click on the photo for wide screen. At the left side of the photo there are leeks that have grown “normally”; no trimming and no hay on (group “Nothing”). In the middle you see leeks that have been trimmed weekly (group “Trimmed”). At the right side there are leeks that have been trimmed weekly and that had hay on the trimmed leaves. (group “Trimmed and hay on”). 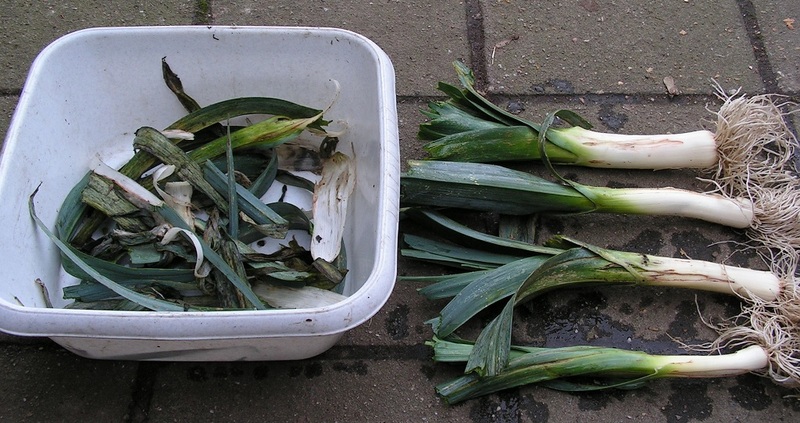 All leeks have been rinsed in cold water to remove the clinging garden sand. At most leeks one or some outer (half or damaged) leaves have been stripped. Below there are close up photos and descriptions per group. With info about appearance of the leeks. And how many maggots and/or pupae were found during preparation (and cutting) the leeks for a meal. Close up photo of 12 “nothing” leeks. Leeks on the photos have been turned over. Almost all leeks show red/brown lines and/or bursted leaves. On some leeks there are miner fly pupae visible. At these leeks there is a serious attack by the leaf miner fly. Click on the photos for wide screen view. Each leek of this “Nothing” group contained 1 or more maggots and/or pupae of the leaf miner fly. At 6 leeks of the group “Nothing”, all pupae and maggots have been collected, see photo above. 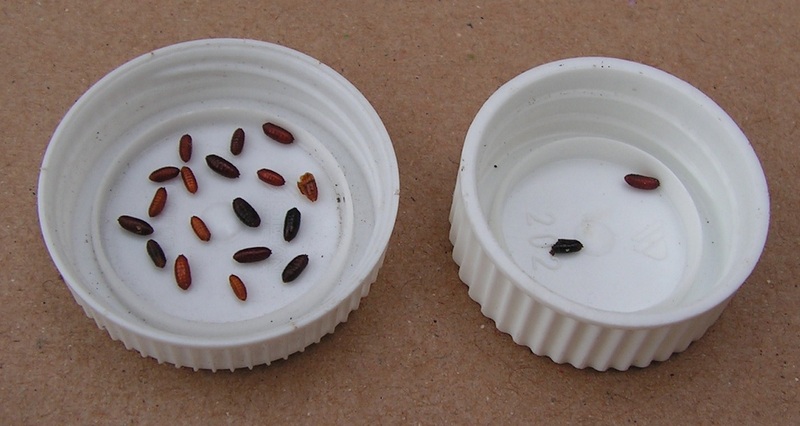 The 6 “Nothing” leeks contained 4 maggots and 10 pupae in total. You better crush the pupae and maggots (to prevent new flies from hatching). Later on, more leeks of the group “Nothing” have been harvested and cleaned. See photos below. 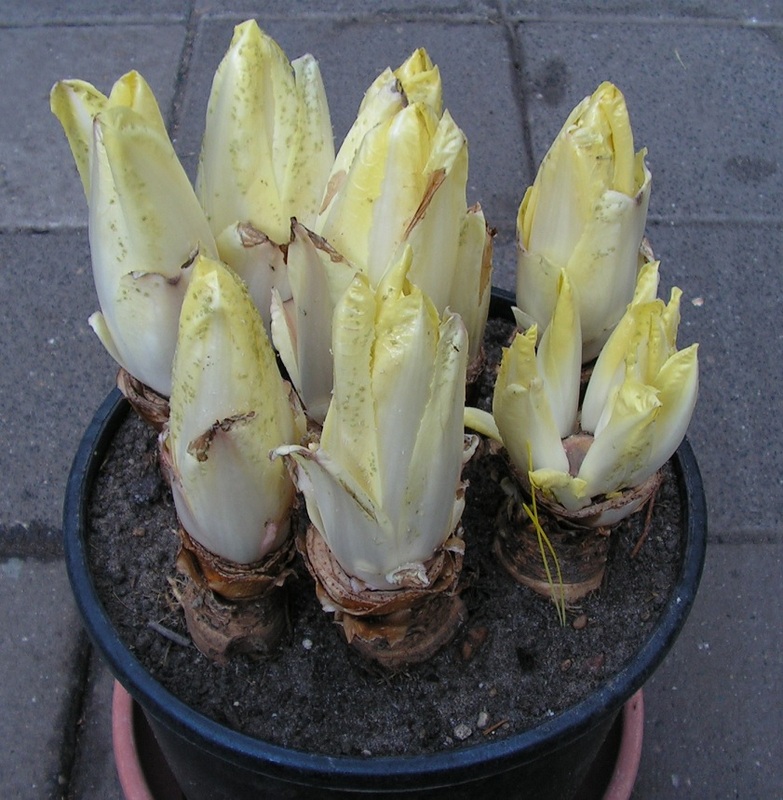 At 4 other leeks of the group “Nothing”, the outer (half, damaged) leaves have been removed and put in the white washing-up bowl (left side of th ephoto above). The leaves in the white bowl have been rinsed in a big bucket with cold water to remove clinging garden earth (and miner pupae). The cleaned leek leaves have been put on a compost container. The 4 “real” leeks have been cleaned and sliced into small leek rings when preparing for a meal. Some miner pupae have been found then. 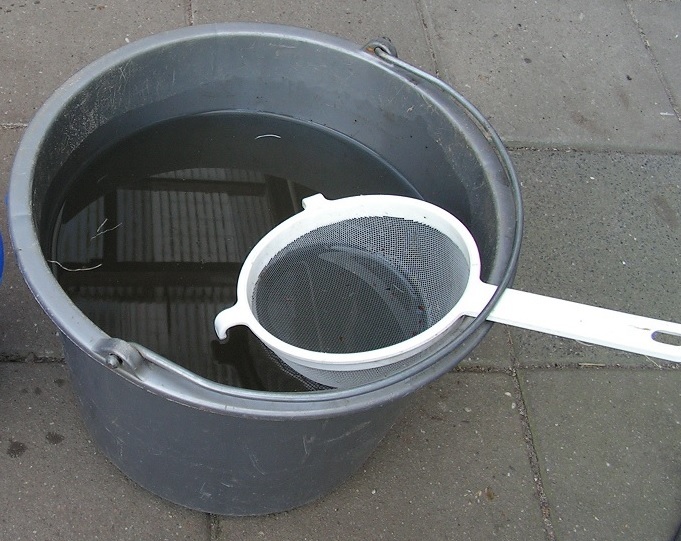 The water in this bucket has been used to clean the outer (half, damaged) leaves of the leeks. During this cleaning, pupae of the miner fly have also ended up in the water. You can use a kitchen sieve to “catch” the pupae in the water. Some miner pupae are so lightweight that they float on the water surface, see 2 light brown pupae on the photo above. Other pupae float in the water. When moving the sieve through the water often enough, you can catch (almost) all pupae. The 2 pupae in the right side cap have been found during slicing leeks into small rings when preparing for a meal. 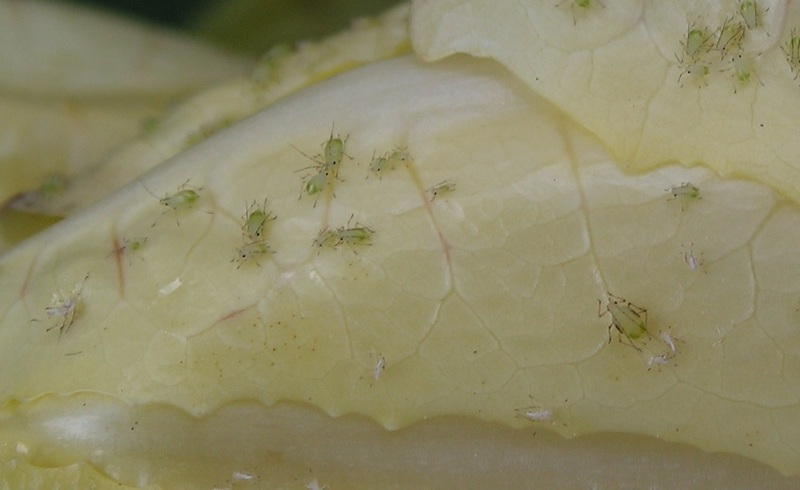 In (on) the outer damaged leaves of a leek there are many miner pupae. In (on) the next leaves of a leek there are much less pupae. So most miner fly eggs are laid on the outer leaves of a leek plant. Why? Perhaps for this reason. The miner flies that hatch from the pupae must find their way towards the outer world. That is easiest when starting in the outer leaves and moving via cracks and tears in the outer leaves. Close up photo of 7 “Trimmed” leeks. Leeks on the photos have been turned over. Leeks look well; no red/brown lines and few bursted leaves. Click on the photos for wide screen view. In these 7 “Trimmed” leeks there was only 1 maggot of the leaf miner fly. Later on, 14 more leeks of the group “Trimmed” have been harvested and cleaned. These leeks are rather thin compared to the other leeks. See photos below. Eleven (11) leeks “Trimmed” show red/brown lines and/or bursted leaves (top leeks on the photo, roots to the right). Three (3) leeks “Trimmed” look well (lower leeks on the photo, roots to the left). Click on the photos for wide screen view. 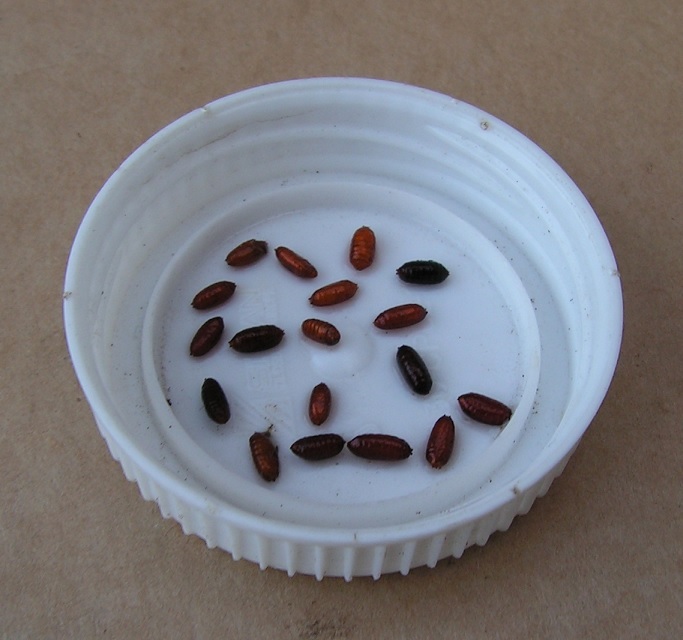 All 11 “Trimmed” leeks with red/brown lines contained these 16 pupae and 1 maggots. Plus 2 pupae in rinsing water. In total 19 Miner insects in 11 leeks. The 3 well looking “Trimmed” leeks contained zero maggots and zero pupae. Close up photo of 6 leeks of the group “Trimmed and hay on”. Leeks on the photos have been turned over. Leeks look well; no red/brown liness and few bursted leaves. Click on the photos for wide screen view. There were zero maggots and zero pupae in the 6 leeks of group “Trimmed and hay on”. One week later, 5 more leeks of the group “Trimmed and hay on” were harvested and cleaned. See photos below. Close up photo of 5 new “Trimmed and hay on”. Leeks on the photos have been turned over. Four out of five leeks look well; no red/brown lines and few bursted leaves (top 2 and lower 2 leeks). Click on the photos for wide screen view. One leek has red brown lines (the middle leek on the photo above). Close up photo of the middle leek. Click on the photo for wide screen view. The leek has red/brown lines until its roots. When preparing the 5 “trimmed and hay on” leeks for a meal, there were no maggots and no pupae in the leeks. At “thick” leeks with short leaves (group “Trimmed”), the leaf miner fly lays no eggs or only a few eggs. There are no or only a few maggots and/or pupae in these leeks. The miner fly looks for thin, slow growing leeks to lay its eggs on. I did not trim my thin leeks well. At thick leeks, trimming big firm leaves goes easy. Trimming thin leeks with weak leaves is much more difficult. At “thick” leeks with short leaves and hay on (group “Trimmed and hay on”), the miner fly lays no eggs or only a few eggs. There are no or only a few maggots and/or pupae in these leeks. At not treated leeks (group “Nothing”, the comparison group), many eggs have been laid on. In these leeks there are many maggots and/or pupae of the leaf miner fly. Weekly trimming the leaves of “thick” leek plants helps well against leaf miner fly attack. At “thin” leek plants, this weekly trimming does not help so good. Don’t know why. Putting hay on trimmed “thick” leeks works just as well as no hay on. Maybe putting hay on works well at thin leeks. I trimmed my leek plants each week. Perhaps trimming less frequent (for example each 14 days) works well too. This trimming procedure works well at thick leek plants. At thin leek plants, trimming is not so effective. And putting hay on thin leeks is harder (hay falls off). Due to trimming its leaves, the leek grows slower; the plant has less green leaf material. When harvesting, the leek plant will be some thinner. When sowing leek in the garden soil in early spring (April), and adding manure in the planting holes, you get many thick leeks at the end of summer (early September). The plants are big enough to trim the leaves then. When you have many pupae in the harvested leek, tip 15) Storage tips chapter I4) shows how to prepare the leek for a meal. On the internet I found a procedure of “cutting back infected leek plants” right above the garden soil level. See this and here . Trimming leaves of leek plants like I do can be found in this Dutch comment (date, time Zo 12 Jul 2015, 10:09 . Translation; “I have trimmed my leeks last year, advice of a gardening friend. Leeks were thick and no attack by vermin”). A previous experiment showed that laying hay on the soil between leek plants do not help against the leaf miner fly. Hay on leek plants helps a little. Spraying liquid nettle manure on leek plants does not help too, that’s my experience. A few hours after spraying, the smell of liquid nettle manure has disappeared. And the leaf miner flies go on laying eggs on the leek plants. When you trim big leek plants and lay hay on only once (and afterwards you do nothing anymore), the leaves start growing again and much hay will fall off the plants. See photos above of one year ago. This procedure works rather well against miner fly attack; 1 leek out of 5 harvested leeks has brown/red lines (the middle leek). These results gave me the idea of trimming leeks weekly with or without laying hay on. At some potatoes I see brown spots (warts). After peeling the potatoe looks normal. This can be caused by mixing (too much) agricultural lime through the garden earth. 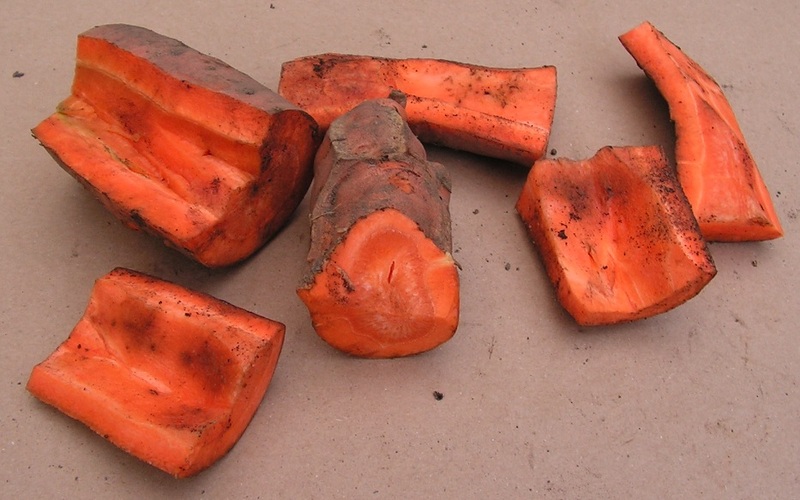 Potatoes grow well in slightly acidic soil. Help: Do not add agricultural lime in the garden soil. This disease is caused by larvas of the the cabbage gall midge. Info on the internet is here . This midge lays eggs on cabbage plants that grow at sheltered, calm places in the garden. My attacked cauliflowers grew next to the stake beans. Plant the cabbages on windy places in the garden. Green or ripe tomatoes can have a brown spot at the lower side (opposite the crown). This is called blossom end rot and is caused by water shortage. The tomato plant is not ill, so keep the plant in the soil. You can throw the tomato in a compost container or cut away the brown material. My plants had this disease during the long hot summer of 2018. Never seen before. Add a little water to the plants dayly. Better add 1 small beaker of water each day than much water once a week. When much rain water falls on the tomato plants and/or when you water the tomatoes too much, you can get tomatoes with cracks. Tomatoes on the plants can get cracks even before they are ripe. When you add a little water to the tomato plant each day, there is less risk of cracks in the tomatoes. Watering goes well when using a bucket and a small beaker. You better pour 1 small beaker of water at each plant daily. That’s better than adding a big amount of water once a week. It is possible that you get brown coloured tomatoes and brown leaves at the plants. This plant disease is called Phytophtora. It is probably caused by rainy weather during late summer, early autumn (August, September). Cold rain water on the plants and fruits causes the plants and tomatoes to get brown (or rot). When you grow tomatoes in the open air in a backyard garden, pick all tomatoes before the end of September (end of summer). Or put tomato plants in a backyard garden under a roof with open sides. To overcome rainfall from above on the plants. Put tomato plants in an allotment garden under a wide roof with open sides and dew drop foil under the roof. Close the sides partly during heavy rain. See also tip 7) Roof over sweet peppers or tomatoes and tip 8) Growing tomatoes . Tomatoes under a roof in my backyard garden at early autumn (September 1). As you see there are a lot of “good-looking” healthy tomatoes. I counted more than 100 tomatoes hanging on 11 plants. Only 10 tomatoes hanging under the roof have brown spots. And some plants have leaves with brown spots. When there is no roof over the tomato plants, tomatoes can get brown spots and rot during “a rainy summer and a rainy, cold autumn”. Tomatoes in my allotment garden. Under the roof there is plastic foil to catch dew drops, so they do not fall on the tomato plants. At dry weather the side foil is folded down. During heavy rain the side foil is fixed to the roof. With side foil fixed, the roof is still airy thanks to openings above and below the side foil. This witloof has grown on chicory roots with non removed outer leaves. Maybe the compost in the flower pot was too moist during witloof forcing too. The left side photo shows the chicory roots before witloof forcing. On the right side photo you see chicory roots with brown short outer leaves right after breaking off the heads. Always cut or break away the outer leaves of chicory roots before forcing witloof heads. More info in chapter N2) of tip 24) Growing chicory . Vóór het groeien van nieuwe kroppen altijd de buitenste blaadjes wegbreken of afsnijden. Zie ook hoofdstuk N2) in tip 24) Witlof kweken . 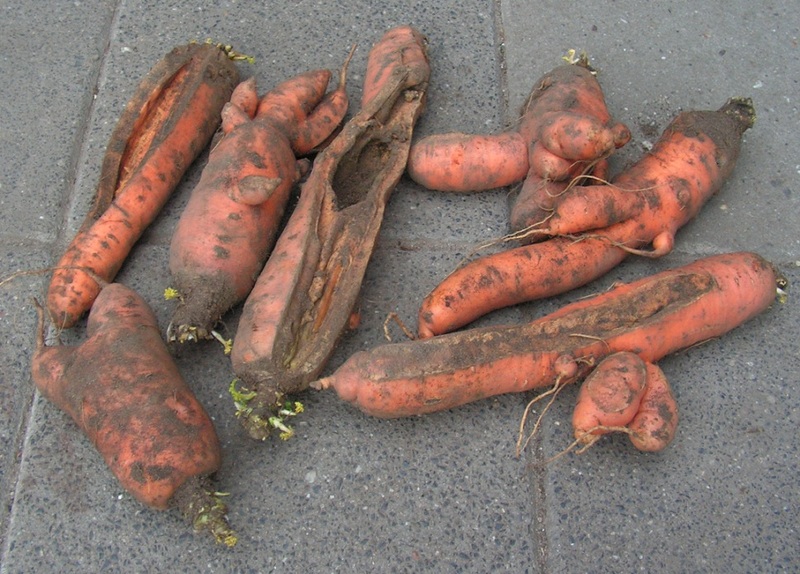 During the growth of the carrots, the garden soil has been too dry for a long time and too moist for another long time. More info in these sites; here and here . Regularly water the garden soil around the carrots. Lay hay or straw around the plants on the soil; the garden soil does not dry out fast. This entry was posted in diseases, leek. Bookmark the permalink.